Technology has obviously changed both architecture and engineering, and the potential for interaction. It has also redefined what each discipline calls ‘Design’. Today, as we enter the post digital era, the role of the structural engineer in ‘Design’ and the processes he uses to realise this varies. Through a selected set of projects this presentation will address ‘practice’, ‘education’ and ‘deliverance’ of design borne out of ‘technical excellence and aesthetic curiosity’ from a small corner of London that is the home of AKT II. Hanif Kara combines Structural Engineering Practice with teaching, and is currently appointed as Professor in Practice of Architectural Technology at the Graduate School of Design, Harvard. He is a fellow of RAE, RIBA, ICE, IStructE, RSA, on the board of trustees of the Architecture Foundation, formerly a CABE Commissioner and served as a member of the Design for London Advisory Group to the Mayor of London. As Design Director and co-founder of AKT II his particular ‘design-led’ approach and interest in innovative form, material uses, and complex analysis methods have allowed him to work on numerous award-winning, pioneering projects. 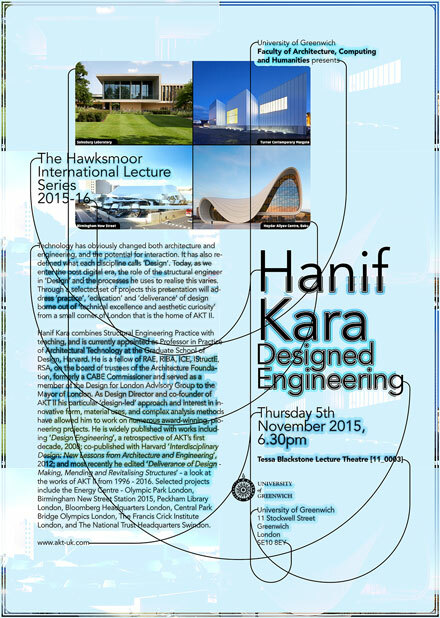 He is widely published with works including ‘Design Engineering’, a retrospective of AKT’s first decade, 2008; co-published with Harvard ‘Interdisciplinary Design: New Lessons from Architecture and Engineering’, 2012; and most recently he edited ‘Deliverance of Design – Making, Mending and Revitalising Structures’ – a look at the works of AKT II from 1996 – 2016. Selected projects include the Energy Centre – Olympic Park London, Birmingham New Street Station 2015, Peckham Library London, Bloomberg Headquarters London, Central Park Bridge Olympics London, The Francis Crick Institute London, and The National Trust Headquarters Swindon.